It is said that a long journey begins with a single step. And sometimes one heads on the road in order to sit at the feet of a master. Seemingly, hundreds of Burroughs fans made the trek to Lawrence to catch a glimpse of el hombre invisible. Even at the dawn of his celebrity at the Beat Hotel in Paris, the curious would knock on his door hoping to be invited in for a talk, a toke or a shot. Some, like Ian Sommerville and Mikey Portman, stayed at Burroughs’ side for quite some time. When Burroughs was alive, I never felt the urge to track him down with an arm full of collectibles and a head full of questions. I hesitate to contact my idols. Looking back I wish I had written him a letter or shared with him an unusual little magazine. Judging from many of the inscribed copies of little mags I have seen over the years, he got a small charge seeing his early efforts in print. He would congratulate the collector on a nice find in his inscription. Gary Lee Nova tells a story of how Burroughs paid particular attention to a rare mag placed before him. In college, I wrote an essay on Andre Dubus‘ short story “The Pitcher” for a baseball literature class. The instructor thought highly of it and it just so happened that he dated Dubus’ daughter for a time so he had the author’s address. I took great pains over a letter of introduction and sent along my essay. It was torture wondering if I was going to get a reply. Diligently I trudged to my mailbox everyday looking for a response. After a few weeks it came in a hand-addressed envelope written in pen on spiral-bound notebook paper. In one and a half pages, Dubus assured me that everything I read into his story was my own fabrication, and he implored me to drop out of the English Department since being an English major would only destroy my ability to read and enjoy literature. Over several moves and the accompanying shifting of boxes and documents, the letter has been misplaced but I hold out hope that it will turn up like sunken treasure in one of my periodic salvaging missions in the basement. Sadly, it remains elusive like the legendary suitcase of Ernest Hemingway that contained his early manuscripts and short stories before The Sun Also Rises. The loss is one of the great shames of my collecting career. Except for that letter, for years I kept largely to myself and have had a limited correspondence. That has begun to change recently but for the most part I still remain wary of my idols despite all the wonderful insight they could bring. 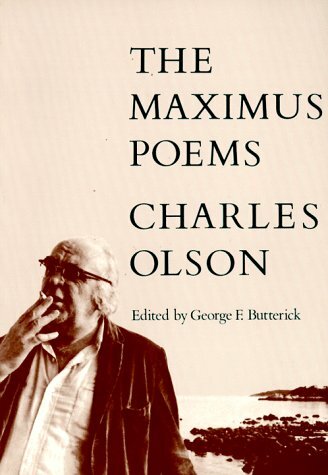 Charles Olson would have been an exception to that rule had I been fortunate enough to have been born a full two decades earlier. From all accounts, Olson was one of the great talkers of all time at home, in the library, looming over the lecture hall, sitting at the kitchen table, or holding forth in the barroom. The depth and breadth of his thought coupled with his mythic endurance made for an exhausting and, for many listeners, a life-changing experience. I like to think I would have tracked him down at 28 Fort Square in Gloucester for an evening of strong drink and heady talk as the fog rolled in off of Ten Pound Island and mixed with the cigarette smoke. During my recent vacation to Maine, I made my pilgrimage to Olson’s place 27 years too late. It was a rewarding experience nonetheless. Gerard Malanga, Ann Charters, Robert Creeley, seemingly everybody at the University of Buffalo in the 1960s, and many others made the journey while Olson was alive. Charter took some iconic photos of Olson in the city he made such a part of his life and work. When I think of Olson I always think of these late images with the cigarette, the rumpled clothes, and his hair looking like that of a wild man of the woods mixed with Biblical sage. Olson sitting on a set of wooden steps or Olson standing smoking on the beach. My girlfriend and I took our pictures too. Exiting Route 128 — completed in 1959, Olson felt this link would be the downfall of Gloucester as a similar link was for Tyre — and winding through downtown Gloucester on the way to Fort Square, you pass the Chamber of Commerce and Visitor Center on the right just off of Main Street and Rogers. The Center is within a stone’s throw of Olson’s house but you will not find any brochures or indication of Olson there. The Cape Ann Museum blurb mentions Fitz Hugh Lane, Winslow Homer, Mardsen Hartley and Stuart Davis but not Olson who was one of the great historians of Gloucester. I got the sense that the opinion of Olson in Gloucester is much the same as that of Kerouac in Lowell. There are a few interested parties keeping the flame alive, and the occasional Olson-inspired tourist, but by and large the city and its residents look on Olson with embarrassment or confusion if at all. The figure of the town drunk or a local character comes to mind. More tolerated than revered or respected. I could be wrong. Driving into 28 Fort Square the first thing that struck me was its isolation. 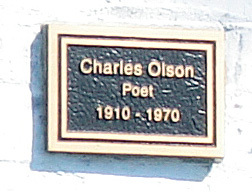 A small plaque stating Charles Olson 1910-1970 is all that adorns Olson’s home base from the late 1950s after his tenure at Black Mountain. The three story building stands in a small community of homes of about 15-20 along a looping road. The house is subdivided into three apartments and an older man about half the size of Olson stepped outside to take out his trash as I was getting my picture taken. I apologized for the inconvience but he waved me off and said no problem. He must experience these interruptions from time to time. 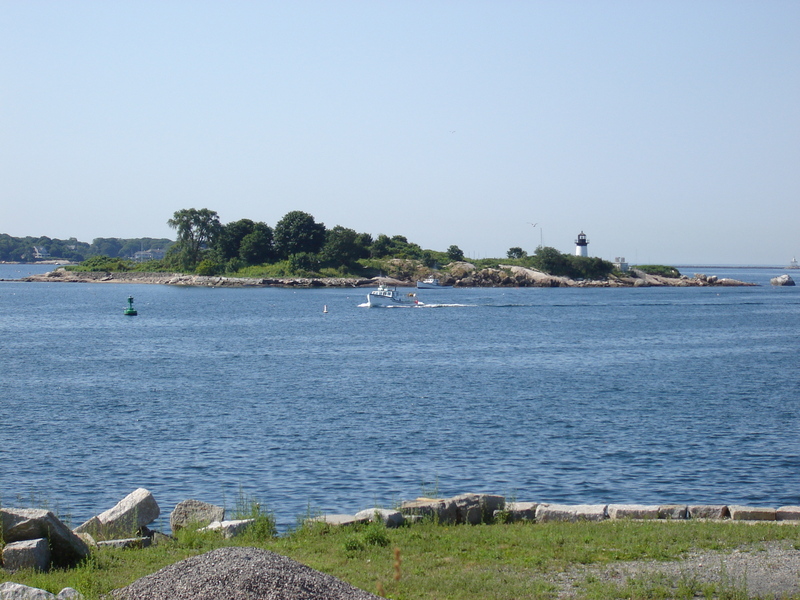 Olson lived on this small point or peninsula in a second story cold water flat dominated by Ten Pound Island just outside his window. The third volume of The Maximus Poems is full of references to the island that lays low in the near distance looking like an ironclad from the Civil War era. There are spectacular views of the Harbor from a small park around the corner. The park was dedicated in 1951 and was rededicated in the 1990s. A small basketball court, a playground, and a few benches overlooking the water comprise the entire park. A little further on is a small beachhead in the shadow of the Good Harbor Fillet factory. On a telephone pole there was a flyer written in three languages including Vietnamese warning people not to eat the shellfish living in the waters off the beach due to contamination. In town local bistros proudly advertised local lobster on their menus. Olson would have had a lot to say about such ironies of present-day Gloucester. Based on The Perfect Storm and Olson’s writing, I prepared myself for the depressing sight of a cross between fishing village and factory town dedicated to canning the day’s catch. 28 Fort Square on the land side sits among several such factories and the smell of the sea mixes in with the stench of fishy waste from the processing plants. In the park, two women and a small girl spoke in what I took to be Italian or Portuguese. On occasion Olson wrote about the immigrants who worked in the plants and lived around him at Fort Square. These scenes coupled with the harbor views, the lobster pods, and the fishing boats seemed straight out of The Maximus Poems and my expectations. As for Gloucester and the surrounding area, it was not what I expected at all. Main Street was all bistros, boutiques and bookstores. The street was cheery and upbeat, full of people walking by saying hello and offering our dog treat after treat. There were many small independent businesses catering to a summer resident clientele. Gloucester has become “tansy,” or overrun with commercialism and the inauthentic, as feared by one of the earliest Maximus Letters. I think Olson would have disliked present-day Gloucester and bemoaned that it has gone soft and flabby like a successful middle-aged businessman confident of his place in the world. Gloucester and the environs revolve around whale tours and yachts not lobster boats and sword fishing. Yet the seafood auction is right below Fitz Hugh Lane’s house on Harbor Loop and a large Groton’s sign stands right in the center of downtown. As Olson realized, America was built on the corporatization of the fishing industry that occurred smack dab in the middle of Gloucester. Yet I have been told that the local bars Olson used to frequent are gone, replaced by the aforementioned bistros selling local lobster dishes and $10 hamburgers. Walking down Main Street and driving around 127A through Rockport and Annisquam I have to admit that I was captivated. The views were breathtaking and the towns were bustling and full of good cheer and smiling faces. Yet everything seemed straight out of a postcard and the shoreline was sunny, too safe and serene to inspire feelings of the sublime. Where were the rugged landscape and rugged individualism depicted in Olson’s poetry? Maybe I was blinded to it by the sunny weather. Maybe I should have driven by Dogtown? Maybe the cradle of America has evolved beyond its origins? Gloucester engenders such thoughts which is why Olson found it such a place of inspiration. Due to its tourist trade, its artistic and literary history, and the summer artists’ colony, Cape Ann is full of galleries and, happily for me, bookstores. All the bookstores I visited reserved a small space for Olsoniana. There is a Beat presence as well, given the interest in New American writing spawned by Olson in the area. Dogtown Books is located right on Main Street. It possesses a mixture of collectibles and used books. The Olson selections were pretty basic such as a few Four Seasons Foundation (Donald Allen’s publishing venture after the New American Anthology and his work with Grove Press and Evergreen Review) publications like a reprint of In Cold Hell, In Thicket. More interesting to me was a trio of early City Lights Pocket Books editions. I was happy to see Kenneth Rexroth’s Spanish translations (No. 2) as well as Kenneth Patchen’s Poems of Humor and Protest (No. 3). They were $100 and $75, respectively. Pocket Books Number Four, otherwise known as Howl, sat behind glass. It was a first edition as it had Lucien Carr on the dedication page. Carr, ever shy of publicity after the Kammerer murder and hoping to distance himself from the Beats, requested that Ginsberg remove his name from its original place alongside Kerouac, Cassady and Burroughs for the second edition and thereafter. In the dedication, Ginsberg announced the existence of Naked Lunch three years before it would be printed by Olympia Press having been previously “published in heaven.” The Howl at Dogtown Books had some slight condition problems but the black and white wraps looked fairly good to me. Originally, Howl sold for 35 cents. Dogtown offered it for $4000. The first American edition of The Wild Boys by Grove Press caught my eye as well. Again it was a nice copy and was available for $125. One of the fun things about wandering a strange city is the surprises that you come upon. A great out-of-the-way lobster pound with only four tables and a scenic view of the coastline. An inspiring view that opens around a bend in the road. And on Main Street in Gloucester, a well-stocked record shop that barely has an internet presence and seems to operate on word of mouth. I knew about Dogtown Books before I arrived in Gloucester, but Mystery Train Record Shop was a complete surprise. The store is packed with records including plenty of jazz on the second floor. Tucked in the back of the second floor is a spoken word section with the usual suspects like Dylan Thomas and T.S. Eliot but after some digging I found a copy of Voices of the Angels issued by Freeway Records. A companion piece to English as a Second Language also on Freeway, Voices is a 2 LP set that documents the LA scene in the early 80s. Sprawled passed out among the over 50 selections on the album is a short piece by Charles Bukowski, one of LA’s finest poets if not the best. Among the comedy LPs were a few Lord Buckley records. Mystery Train definitely had a Beat feel to it. The owner pulled a copy of the Kenneth Rexroth and Lawrence Ferlinghetti reading at the Cellar on Fantasy. Fantasy also issued a Ginsberg LP including Howl in the late 1950s. The Rexroth / Ferlinghetti LP was $72.50. If Mystery Train was not already a welcomed surprise, throughout the store there were small piles of magazines. They were mostly science fiction magazines, but a few Whole Earth Catalogs and some issues of Ralph Ginzburg’s Fact were sprinkled about. Ginzburg published Eros in the early 1960s, a hardcover magazine similar to the more salacious later issues of Evergreen Review and the Olympia Review. Eros ran into some trouble with the censors over pornographic content. Looking at the magazines today it is a joke. I had a set a long time back that I sold in a time of desperation — another sad episode in my collecting career. Ginzburg held tough and went to jail. His court case along with the trials involving Lenny Bruce, Lady Chatterley, Howl, Tropic of Cancer and lesser known but maybe most importantly the publisher Samuel Roth, established the legal climate that surrounded the Naked Lunch trial in 1966. Coincidentally, I found a late issue of Evergreen Review from 1969 with Robert Kennedy on the cover. This issue happens to contain not one but two Burroughs appearances. One was an interview selection with Daniel Odier from what would become The Job in 1970. The other was a Burroughsian travel piece called “My Mother and I Would Like to Know,” an excerpt from The Wild Boys. Given that I was on vacation, this seemed appropriate. “Nobody gets through my cover. I assure you. There is no better cover than a nuisance and a bore. When you see my cover you look the other way fast. For use on any foreign assignment there is nothing like the old reliable American tourist, cameras and light meters slung all over him.” I snatched it up for $2 along with the second and third issues of Scanlan’s, the magazine that was the birthplace of Gonzo Journalism having brought Hunter S. Thompson and Ralph Steadman together. Thompson’s seminal piece on Jean Claude Killy appeared in the first issue. The equally important piece “The Kentucky Derby is Decadent and Depraved” appeared in the fourth issue. The Kentucky Derby essay, if you can call that unholy mess of drink and drug-induced genius an essay, was the first time Steadman and Thompson worked together. The two both graced the pages of the first Scanlan’s in separate articles. Mystery Train had the second and third issues. Issue two still possessed the Vietnam War flexi-disc attached to the magazine. Unlike many of the LPs for sale at Mystery Train, it had never seen a turntable. After a lunch at The Lobster Pool just outside of Rockport, I headed on Route 127A into Annisquam. If you drive too fast you will pass Ten Pound Island Books sitting just of the road to your left. Like The Lobster Pool, Ten Pound Island Books is little more than a shack. I expected a boutique-type atmosphere given owner Greg Gibson’s presence on the rare book fair circuit and the high quality of his nautical and maritime books. Gibson, the author of Goneboy and an account of a lesser-known but fascinating mutiny of the Whaleship Globe, came to Cape Ann following in the footsteps of Olson. 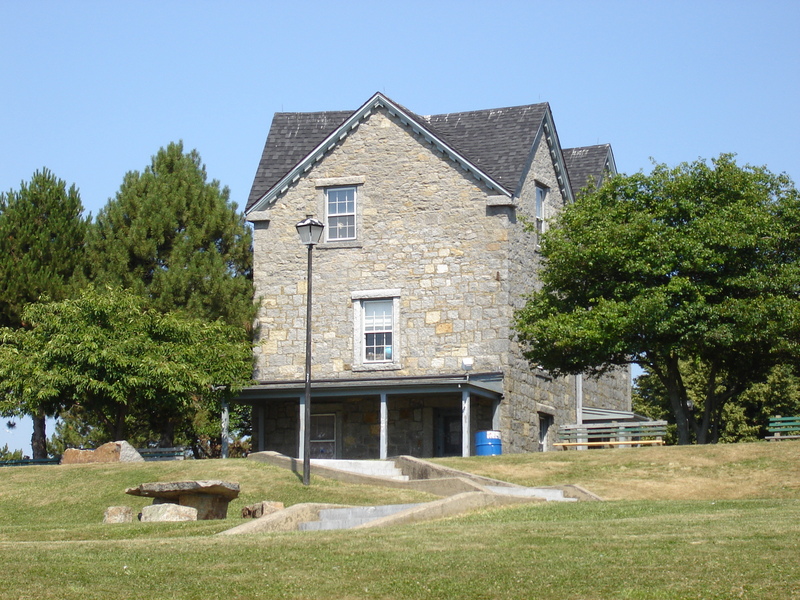 The small building is weather beaten and crowded with everything you could possibly want on the history of Cape Ann and other seafaring communities and topics. I was searching for a photography book entitled Olson’s Gloucester by Lynn Swigart and sure enough it was tucked away in the Gloucester section alongside several other Olson books. The photo book has an informative foreword by George Butterick, the foremost expert on Olson, as well as an interview with the photographer conducted by Sherman Paul, author of Olson’s Push, a solid study of Olson’s work, if a bit on the dry side. The black-and-white photos contrasted greatly with the sunshine-splashed vistas that I experienced in Gloucester and Cape Ann, and they served as a wonderful addition to my view of the area. I especially appreciated the pictures of Our Lady of Good Voyage in Gloucester and Whale’s Jaw in Dogtown that I did not get a good look at or at all. Written by Jed Birmingham and published by RealityStudio on 1 August 2007. Jed, great post. Wonderful detail and insights. This is the kind of piece that makes me envious that I wasn’t there – mostly because I feel like I almost am reading it. Glad that I stopped back and read the post. I had done the trip in ’63. I missed Olson, but spoke to his wife. She said that tours really knocked him out and that he wasn’t sociable for a few days. I did run out to Dogtown which was a really wild area at the time. I saw Bob’s Clam Shack, but not Lufkin’s Diner. I also got to stop and talk to Vince Ferrini at his framing shop in Rockport. He wanted the New York gossip and sold me copies of SET. I packed them in with the firsts that I had brought with me and ambled back to New York in time for the Even Dozen sessions. BTW I recommend Michael Rumaker’s “Black Mountain Days”. You get a real sense of Olson, the man. You also get a feel for the struggle that it took for them to get out the little mags and the chapbooks that we collect today. I enjoyed reading your post about my town. You hit on the hot spots in town. Mystery Train, Dogtown Books and Ten Pound Island Books. Perhaps you or your readers may be interested in “Polis is This: Charles Olson and the Persistence of Place,” a new film about Olson viewed through the lens of Gloucester, Massachusetts. Also you also may be interested in “Lowell Blues:the Words of Jack Kerouac”, a 30 minute film on “ti Jean” and Lowell that I made back in the 90’s. Kerouac came to visit Olson in Gloucester one evening. I would have liked to be a bug on the wall. Just wanted to let you know that you couldn’t have “driven by Dogtown” as it is somewhat deep in the woods. A lot of the ruggedness and darkness of the area isn’t something that is as noticeable to a tourist. Surprisingly, I don’t know much about Olson, but I love Burroughs, so I’ll have to look into his work. Thanks for this. I’d love to get there one day. You have a lot of great details here. Bravo. As I write this, I just got a copy of The Selected Letters of Charles Olson, edited by Ralph Maud. I’m already digging in and out. Count yourself blessed for making that journey. Keep up your fine work.